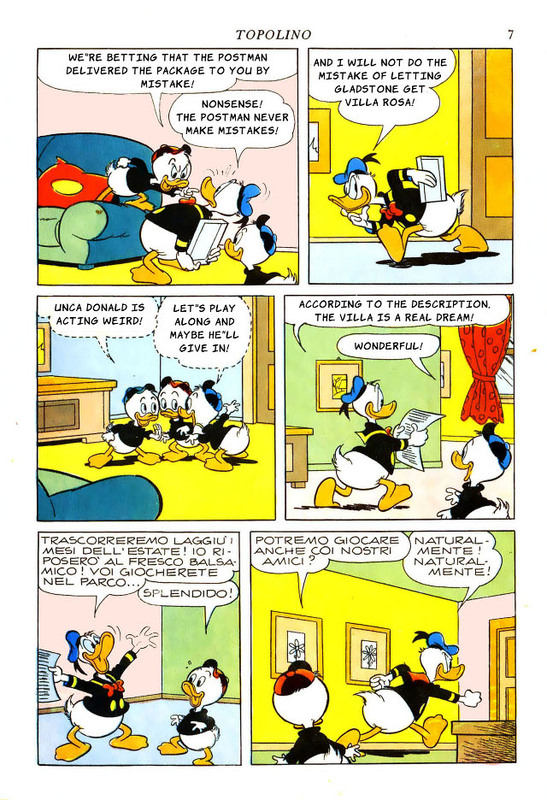 So, while we all anxiously await the translation for the next issue and since it hasn't been done yet (unless I really missed something), here - have the first five pages of "Paperinik il diabolico vendicatore" (the debut of the Duck Avenger, for those not in the know) translated to English for the very first time. This is merely a preview, as my plan is to complete it, so comments are welcomed. Hopefully, I'll have the first part done this week and the second part sometime next week, but I don't expect myself to be as insanely quick as a certain Mr. Banker. 1. 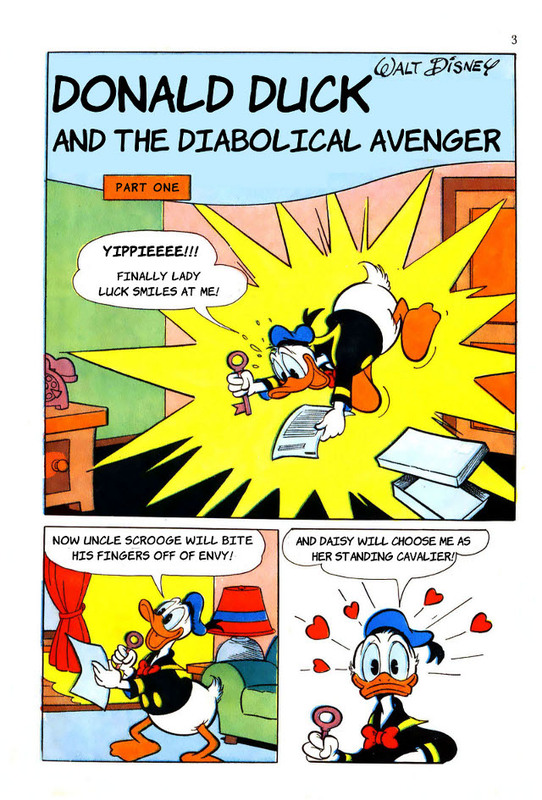 I decided to call the comic "Donald Duck and the diabolical avenger" even though it is a bit wrong. The correct translation would of course be "Duck Avenger and the diabolical avenger" but using the word "avenger" twice in a title both looks bad in this case and is probably quite a bit confusing. 2. Page 5 (the last one), panel 2. Donald is not supposed to speak here, but rather think to himself. Hence, the translation is correct, but the panel is wrong. This is changed in my physical copy of the comic and I may attempt to change it accordingly. 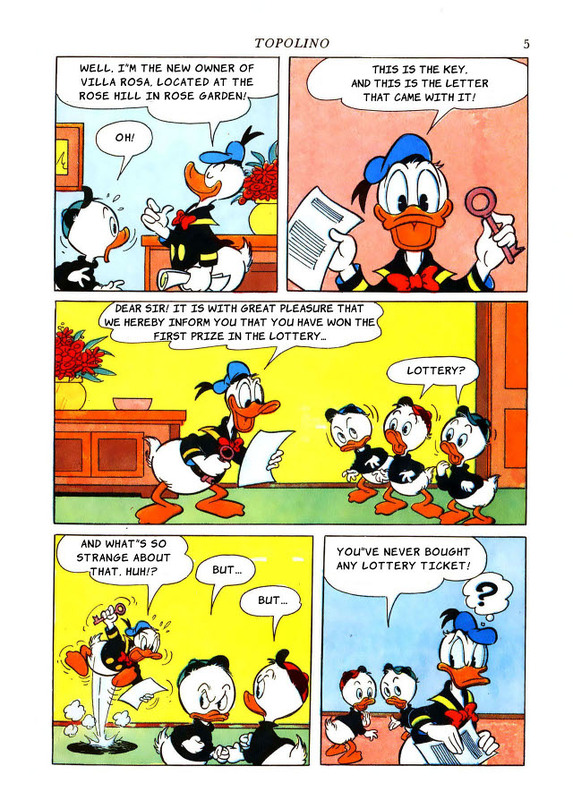 Also, the scan is of the original print of the comic, printed in Topolino 706, and was not scanned by me. Finally, the final release will be in higher resolution and in cbz. Anyhoo, on to them pictures! Oh, me likey. Nice work, Blot. Personally, I'm really not satisfied with the font. What font are you using Banker? And yeah, I totally missed the last two panels on the last page there. Whatever, it'll be fixed in the proper release. Anyhoo, sleep is for the weak. Thus, I'm going to bed. Page 5 (the last one), panel 2. Donald is not supposed to speak here, but rather think to himself. I just checked the German version (reprint from 1992) and it isn't a think bubble there either (though they probably just did a lousy job during the translation). Wow! Compliments for the initiative! Anyways, better be working on the translation now as I found some time to do it. Also, holy mackerel, Donald's really a jerk in this one! 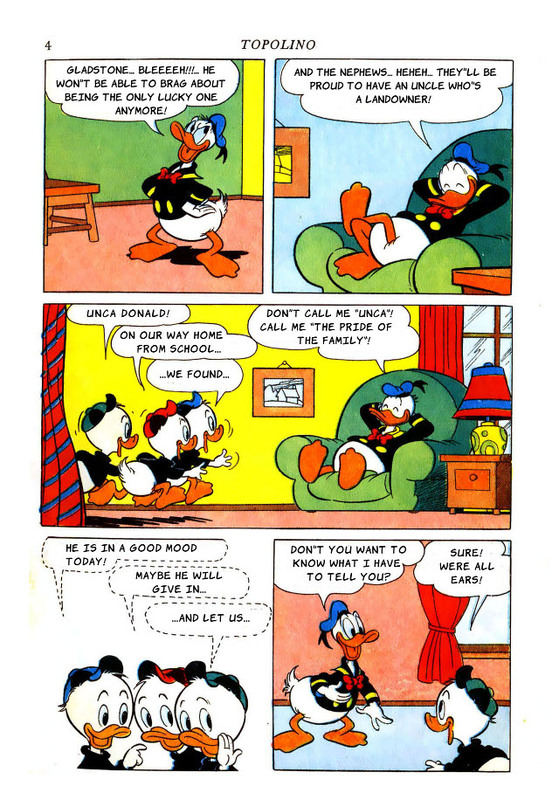 Yeah, I know, I know, nothing new to those that have read it, which I have several times, but it's more that I was much younger back then and first now can analyze the comic in a good way, and I must say this is probably the biggest douche we'll ever see Donald as. 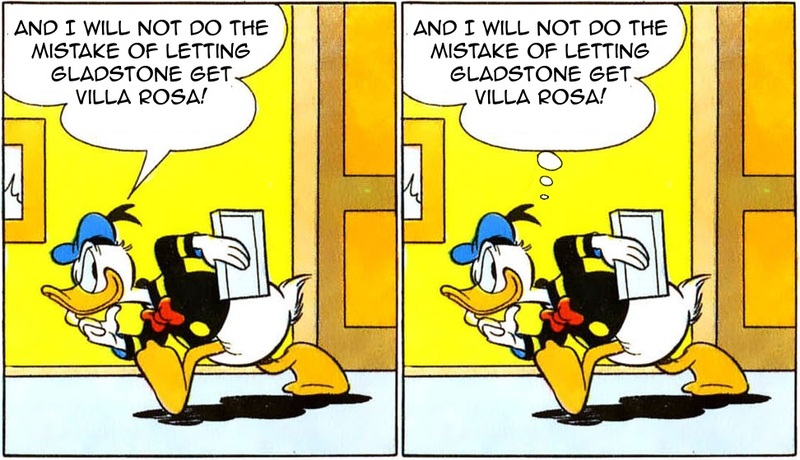 Sure, it's not entirely impossible to not sympathize with him, seeing as Scrooge is in über-jerk mode and Gladstone being his usual insufferable self, but still. Especially his attitude towards the nephews which is on an all time low. this is probably the biggest douche we'll ever see Donald as. That was worse. I stand corrected. Nice one, Banker! I saw this first a few years ago and it still makes me lough. Where's does this come from? I've only seen it on sites like FailBlog. 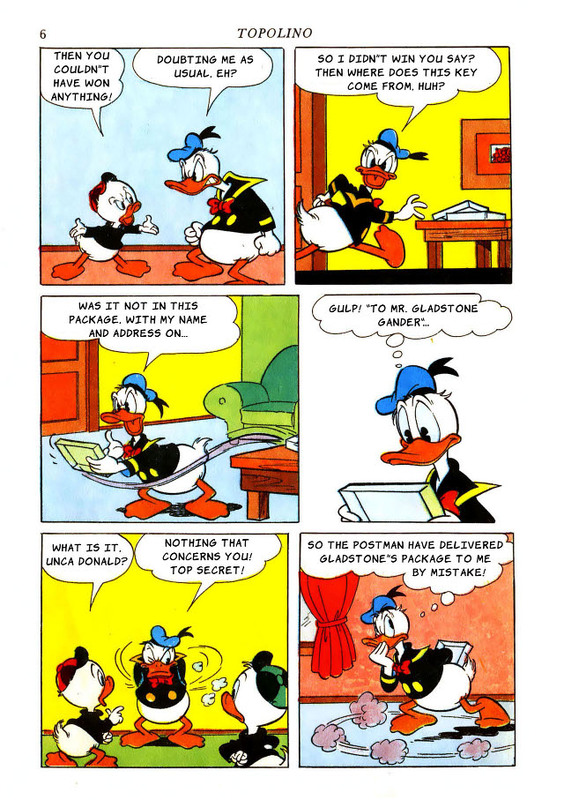 I think Donald is pictured this abusive in these early comics because of his character. He's always the big loser and is abused by Scrooge, Gladstone or his creditors on a regular basis (much more than in today's comics). So it seems only natural for him to want some payback (at least most humans would probably act this way, if they were in his place). Keep on doing this great work, Mr Blotling, your edit looks very nice. Did you use the file which had been posted at the Blog or did you acquire it somewhere else? I think it's from the very first issue of Walt Disney's Comics and Stories. Eh. Most of the time I see Donald acting like a d*ck, it's usually for no f*cking reason at all. And it's done! Work with part 2 will begin soon. God, I hate custom shape speech ballons! Link is on the blog as the board won't let me post links yet. Did you use the file which had been posted at the Blog or did you acquire it somewhere else? It is taken from a scan of the complete Topolino 706 (and 707 for part 2) which I found floating around on the interwebz. I never found the scan on the blog, either I'm blind or I simply was too lazy to look around enough. Yeah, a sunday newspaper page that was also published in WDC&S #1. Yes, it will be done. This week wasn't a good week for doing much translating (there's some minimal work done on it) as lots of other things have taken up my time, among them reading up on the last few PKNA issues that's been translated (still have Chronowreck left) and I also got book 1&2 of the Gottfredson archive (which really is something to check out if you're into Disney comics) which I haven't read anywhere near of as much as I would have liked to. But yeah, I'll work on it (part 2 that is) this week, hopefully I'll have it done by the weekend. And I'll be returning to work right about now. Yay! Thank goodness. That silent was so sad for me. I felt so happy when I discovered that someone out of Italy was caring about PK. Now, we can finally have an english version of the first story of the Duck Avenger! Not much to add from my side; It's been a week since I ran out of things to scan and the issues between 40 and 48, that should have arrived since two weeks still haven't shown up (I really begin to hate the Swiss postal service). I'm working on Krozam's issue 40 scan but I'm not quite done. In any case, I went and cleaned up the poor quality scans. I'll use those if you don't get that done in time. Part 2 can now be found on the blog along with an improved part 1. Yay! ... you know, Angus' accusations suddenly make a lot of sense.